Bishop Noel had served the Diocese as its leader for 21 years and during that time he introduced many pastoral initiatives and offices including Centacare Family Services, Faith Education Sandhurst, the Renew and Many Parishes One Purpose Program, Ministry to Priests Program and Continuing Education of Priests, Vocations Ministry, Youth Ministry, Sacramental policies including the Steps in Faith parish approach to Confirmation-Eucharist preparation. He will be interned in the crypt at Sacred Heart Cathedral, Bendigo. 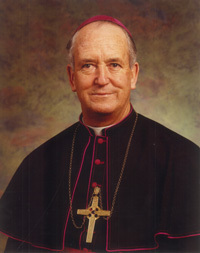 Bishop Noel had served the Diocese as its leader for 21 years (1979-2000) and during that time he introduced many pastoral initiatives and offices including Centacare Family Services, Faith Education Sandhurst, the Renew and Many Parishes One Purpose Program, Ministry to Priests Program and Continuing Education of Priests, Vocations Ministry, Youth Ministry, Sacramental policies including the Steps in Faith parish approach to Confirmation-Eucharist preparation. These initiatives benefitted the whole community. Noel Desmond Daly was born in the Gippsland centre of Sale into a devout and very Catholic family on February 10, 1929. Noel had 6 siblings, 3 of his brothers became Marist Brothers and his youngest sister became a Josephite. He expressed his gratefulness to his parents who were able to give them a secondary education when these facilities were not available to many at the time. Ordained a priest for the Sale diocese on July 27th 1952 at 23 years of age, his first appointment was to Yallourn in January, 1953 before moving to St Michael's, Traralagan during September that same year where he remained until December, 1959. His sense of dignity, warmth, gratitude and graciousness won him support throughout the Diocese. In the following years he served for varying periods at Lakes Entrance, Leongatha, Warragul and Morwell before being appointed Prelate of Honour and Vicar General at Sale. In 1974 he became Diocesan Secretary. He was appointed Bishop of Sandhurst on April 27th, 1979 then aged 50 and was ordained Bishop of Sandhurst on July 11th, 1979. "He had the ability as a leader to encourage those who shared his optimism for humanity and love of the ordinary. His bright and passionate faith shone through even the most difficult situations." In 1989, while visiting Pope John Paul II, Bishop Daly detoured to Peru to visit a Sandhurst Diocese Priest working there. Bishop Daly along with Fr Rom Hayes and Monsignor John Duffus were caught in a riot between rock throwing unionists and a police water cannon. Trapped in a volkswagon sedan for almost 15 minutes, all escaped unscathed. He is widely credited with helping re-establish the historical and cultural links between Bendigo and the German community of Paderborn (the hometown of Bendigo's first priest, Dr Henry Backhaus), Bishop Daly was invested with the Knight Commanders Cross of the order of Merit in 1996 by the German consul-general. Ill health forced him to retire in July 2001. In that time he was the spiritual leader of more than 86,000 Catholics throughout Central and northern Victoria. This was celebrated by an emotional service, attended by more than 600 people and 40 priests at the Sacred Heart Cathedral. In 2003 he received a Centenary Medal and was described by Mayor Rob Fyffe as "a worthy recipient of the award." On January 14th, 2004, Bishop Daly died suddenly just a few weeks prior to his 75th Birthday. In a capacity filled service at the Sacred Heart Cathedral led by his successor, The Most Reverend Joseph Grech, long time friend Monsignor John Duffus presented a colourful Eulogy that was described by most as 'a testament to the man'. "He loved people, and people loved him." "He would always support us all." As if on cue, bright rays of sunshine, enhanced the brilliant colours of the cathedral's stained glass windows, bathed the coffin in an orange yellow light, something that surely warmed the hearts of those who noticed it. Concelebrating the Requiem Mass were 2 Cardinals, 3 Archbishops (including the Archbishop of Sydney, Cardinal George Pell), 20 Bishops and over 100 priests from Sandhurst and other dioceses. He was interned in the crypt at Sacred Heart Cathedral, Bendigo.